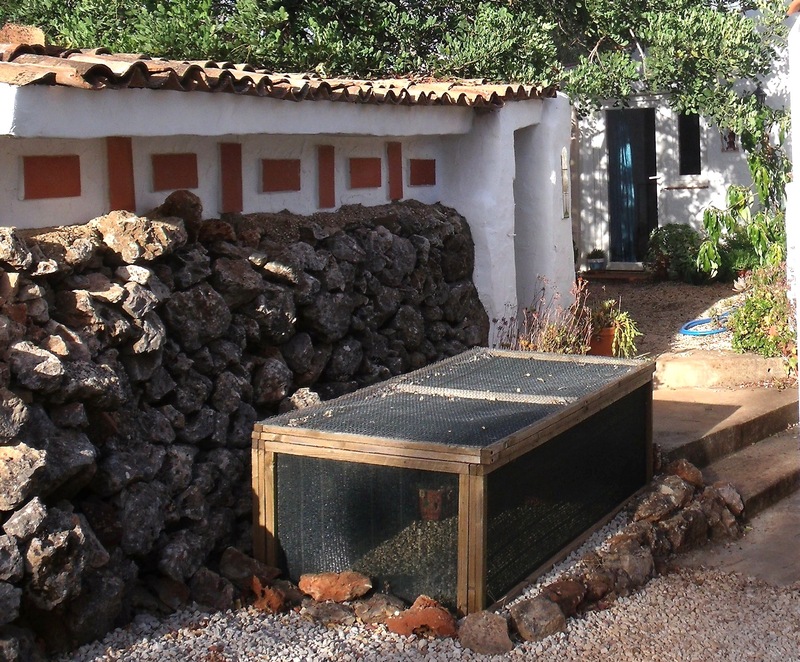 I enjoy growing things to eat and have in the past grown a variety of vegetables but in the Algarve the amount of water these plants require is enormous. We don’t have a borehole and have to rely on either our cisterna, this catches the winter rains and it’s free, yippee, or the mains water and oh dear me this is expensive. Last winter we had hardly any rain so the cisterna is pretty low, vegetable growing this year is out of the question. 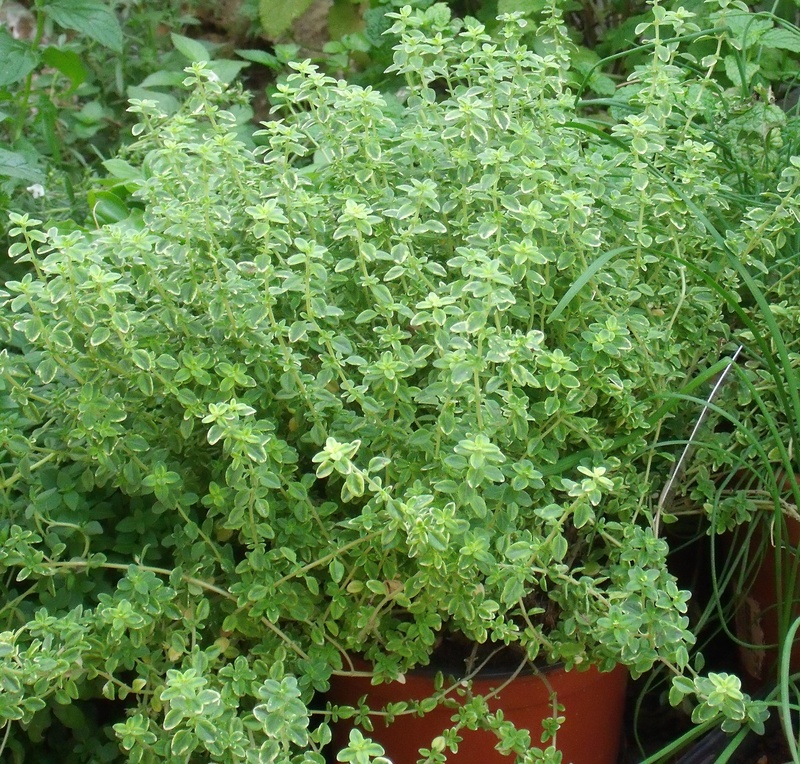 However not to be left without any produce from our land other than the plums, grapes, lemons, oranges, grapefruit figs, almonds, olives and peaches that is, I decided to turn my attention to herbs that can be grown in pots and are therefore that much easier to keep moist. I stress that the pots are plastic as the terracotta ones although they look so much nicer, dry out almost as soon I’ve watered. Shade is also at a premium here as the sun at this time of year shines directly overhead so very little shadow/shade can be had. 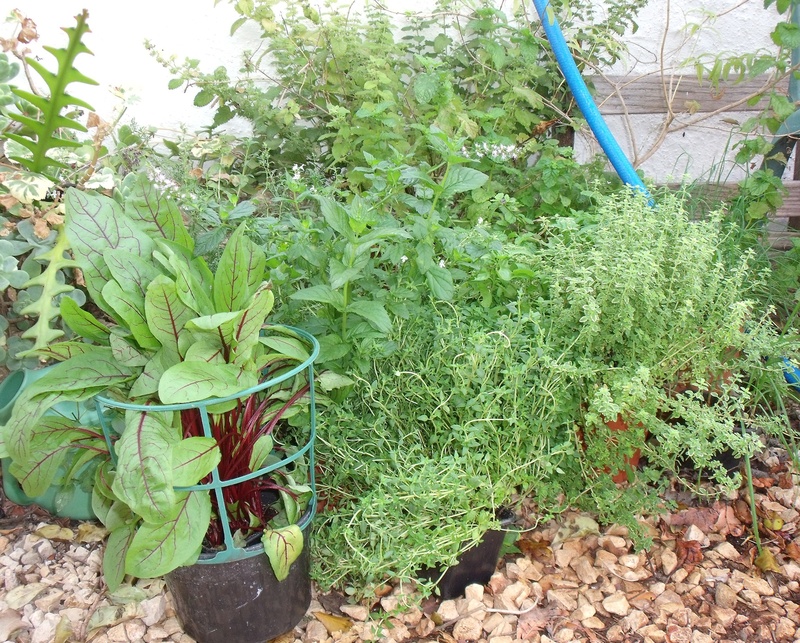 We use an old sunshade to give the herbs in this area some protection. The other herbs are shaded by either the carob tree or the shade frame; a frame of wood covered with green plastic shading and it does have a hinged lid, my clever husband made it. I so enjoy being able to pick these tasty morsels and add their flavour to my salads, soups, pizzas, pasta and anything I think will be enhanced by their use. 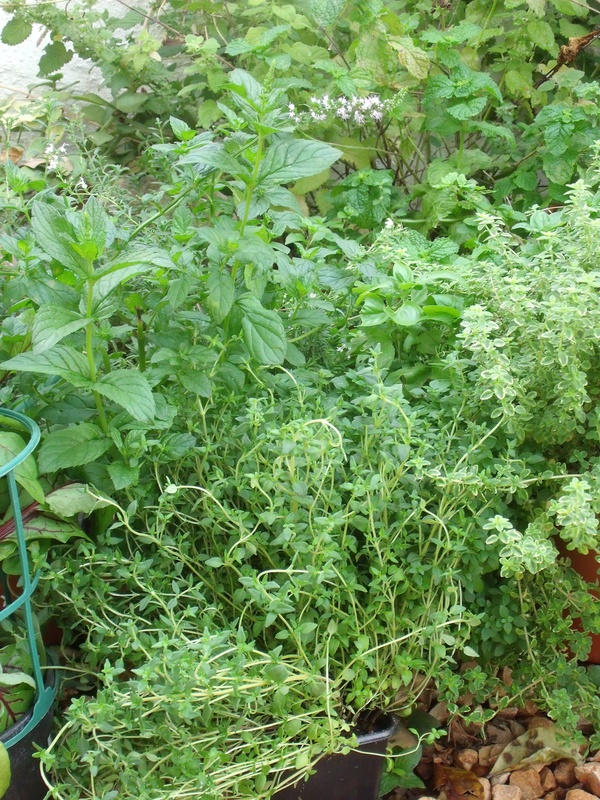 Teas have been made using the mint, lemon verbena and a mixture of the others. 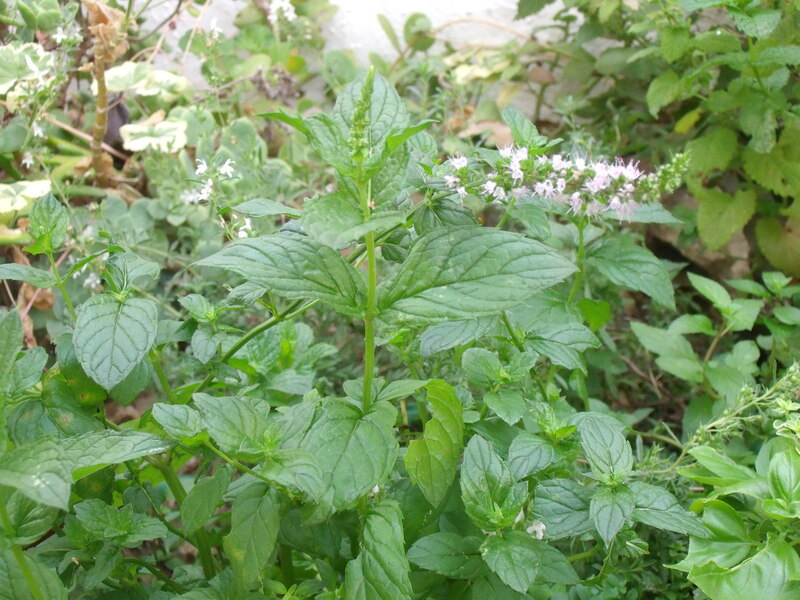 The chocolate mint has a distinctive flavour and can be mixed with ice cream and other sweet things. Even the flowers can be used imparting a slightly different flavour from the leaves of the plant and they do make a salad look very pretty. I’m not too good with a sharp knife and on several occasions my kitchen has resounded with me shouting “Get me a plaster please” and my husband appearing with said plaster and taking in the blood bath before his eyes starts to look for the severed limb. I hold up my wounded finger or thumb, that I have already attended to with a piece of aloe vera cut from the plant that I keep in a pot by the kitchen door for just these emergencies, and the plaster is applied so no more drippy blood. 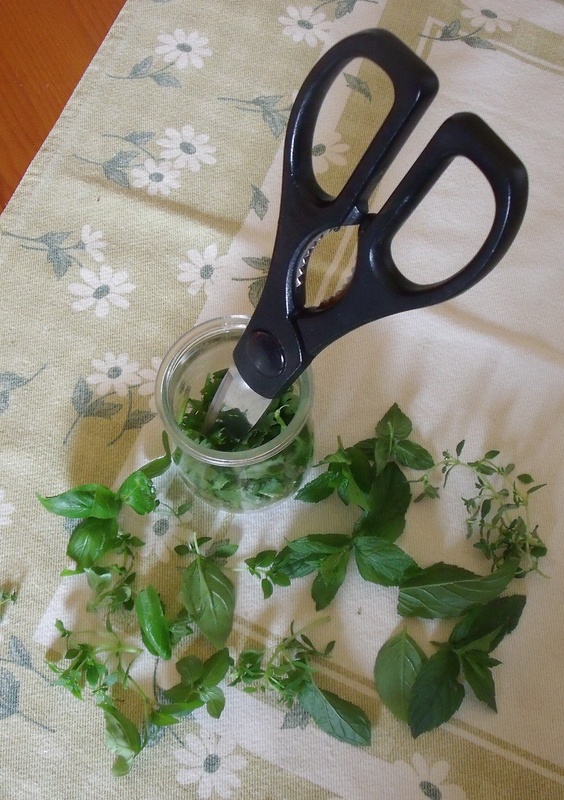 Now my Mum knew a thing or two about safety in the kitchen and always chopped her herbs with scissors, I’ve moved the idea on a little by putting them in a small container and snipping away with scissors until they are the size I want so no more plasters needed and the work surface doesn’t get covered either. Now this hasn’t negated the need for the aloe vera plant to remain at its station by the kitchen door, oh no, I’m very good at burning myself too! Herb poultice anyone? Yes it makes it so much easier to water with the lid held up on it’s own. …. and then *Wails* to Self. Sat indoors with Rain pounding on the roof . Oh what we wouldn’t do for a little of the wet stuff, we haven’t had any rain to speak of since last year. I would really enjoy meeting you, I’ll take off a cutting and pot it up so that when we meet you’ll have a little plant. Delighted you feel you want to re-blog, yes of course you can. I just want to mention I am new to blogging and definitely liked you’re web blog. Most likely I’m planning to bookmark your website . You certainly come with superb stories. Thanks a lot for sharing with us your website. I’m using WordPress they have a good choice of themes to choose from. Take a look and see if you find one to your liking. I am thankful that I discovered this weblog, just the right info that I was looking for!